Thanks Rowan, the feedback is very much appreciated. I am a sucker for the 50's and 60's cars, especially the Chevys. Lots of chrome, huge variety of body styles with the developments over 2 decades, big fins, big engines, stylish interiors, what's not to love? I am a sucker for the 50's and 60's cars, especially the Chevys. Lots of chrome, huge variety of body styles with the developments over 2 decades, big fins, big engines, stylish interiors, what's not to love? I think you've read my mind in terms of styling! All we ever had in the UK were watered-down interpretations of the real thing. Perhaps I should go for a '58 Impala? Apparently, Buddy Holly owned one - and it was listening to his old recordings that first inspired me to pick up a guitar. Rowan, you will get all the encouragement in the world from me to grab a 50's Chev! As an added bonus, anything that drives you to pick up a guitar has win written all over it. As for the 58 Impala, it is a beautiful looking machine and I have a couple of kits hidden away somewhere. One of them will face some major surgery for conversion to an "El Camino", because, well, that's what I do! I'm trying to find more info on this one, I think it had the tub of a 59 El Camino grafted into it. It just looks so cool. D, that's one beaut of a car and the colour pops in that sunlight. 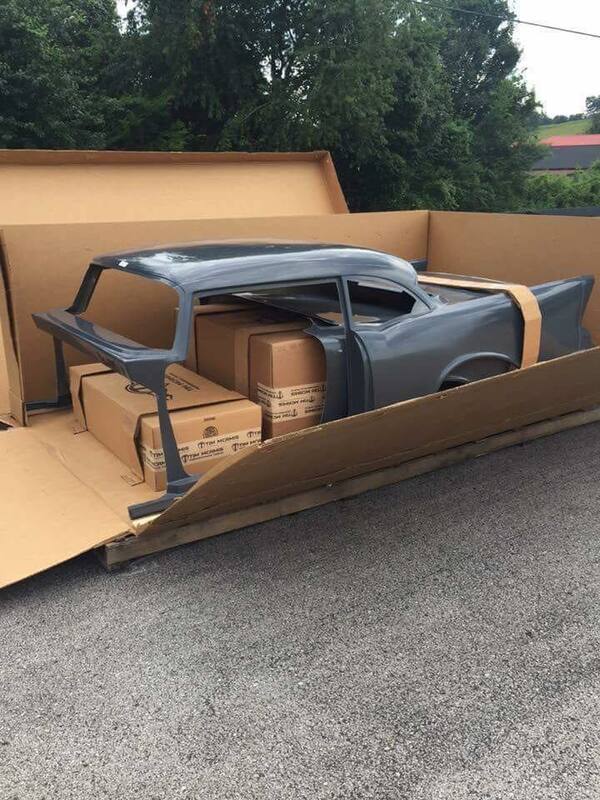 I think looking at this and your builds plus your postman hauls I'm being drawn in on these Chevy's, I can see one joining the stash soon. Hmm, 53 - 59 Chevy group build? That '53 is evil, thanks for the link Luciano! The 50's Chevy range is just full of character, definitely my favourite brand and era! Hey D, here's one you don't have in your stash yet. I just showed this to my wife and reminded her that it’s my birthday in a couple of weeks. Unfavourable response. Not so many cheers, D.
Another thing with have in common. Buddy Holly was one of my absolute favorites growing up. I have his greatest hits on CD, transferred to my Cell, and of course on my computer. When he died in that plane crash, I, along with my friends were just crushed. Now that's a kit car of all kit cars. Wonder what something like that costs, and what it comes with in the box. Buddy was killed just over a month before I was born, but he remained very popular in the UK for several more years after his death, so I think I must have absorbed his music while still in my cot (my late brother was a fan and would certainly have been playing it in the house). I say this because when I discovered him and The Crickets in the early '70s, it all just seemed "familiar" somehow and an instant inspiration to get a guitar. The recordings Buddy Holly made sound just as fresh and valid today as when he went into (mostly) Norman Petty's studio. And they are even more impressive with hindsight because, with no possibility of drop-ins or cr*p like pitch correction, he and the boys just went in and totally nailed it time and again! I was in awe when I began playing and singing - and I remain so! Tried out a new paint for the first time tonight, Mr Color Super Metallic Chrome Silver SM06. I have to say I am very impressed! Pre-thinned ready to airbrush, but I put a couple of drops on MLT in half an airbrush cup to slow the curing and get it to level out a bit better. Sprayed very nicely and covered the bright red paint very well. I have now masked and chromed all of the trim. Once this is cured the next step is to mask the chrome then unmask the roof ready for its colour. That chrome paint looks excellent! I'll definitely add a pot to my arsenal of finishes. Going back to the '58 Impala, I spotted Revell's 1:25 kit on e-Bay - and it coincided with e-Bay sending me a code for a £10 discount, so I could hardly turn down the chance. And best of all: No Autotune or click-tracks! Yep - I still get a giggle every time I hear Ringo Starr's comment about Jeff Lynne forcing him to use a click-track for The Beatles "Anthology" singles - "I am the f*cking click-track!". In the past I have used Alclad Chrome but I am finding it is very fragile and I lose the finish through handling during the build process. Any protective coating I have tried has dulled the finish and “defeated the purpose”. Bonus birthday goodies, love your work! That Silver chrome looks nice indeed! More and more of choices around for replicating chrome. Great looking build so far, like the red colour and the interior goes well with it. Very impressive result, with the chrome silver. Really pops out on the red Hood. Thanks for the feedback everybody, I'm very happy with the way this is shaping up now. I have masked the chrome off tonight so that I can paint the roof. I used tape that had already been used, and also "detacked" it some more, so we shall see how resilient this paint is to masking very soon. Step 1, 3 good light coats of SMS Premium White, 15 minutes drying time between but no sanding, followed by light wet sand with 4000 then 8000 grit sponges. Step 2, 3 light coats of SMS White Pearl, 15 minutes drying time in between but no sanding. A couple of hours to cure fully then this will get the 4000/8000 wet sand and then 3 or 4 coats of gloss.